Heat nonstick Dutch oven over medium-high heat. Add sausage; cook 4 to 5 minutes, stirring frequently, until no longer pink. Remove sausage from Dutch oven; drain on paper towels. Set aside. Wipe Dutch oven clean with paper towels. Add onions; cook over medium heat about 5 minutes, stirring occasionally. Gently stir in cooked sausage and remaining ingredients. Heat to boiling. 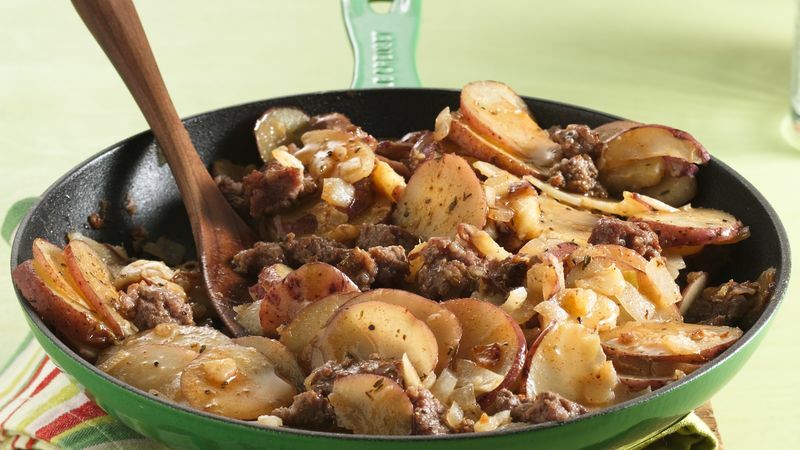 Reduce heat to medium-low; cover tightly and cook 8 to 10 minutes, stirring occasionally, just until potatoes are tender. Remove Dutch oven from heat; gently stir mixture. Let stand covered 10 minutes to allow flavors to blend and light sauce to form.